I visited Badshahi Mosque, Pakistan's (and South Asia's) second biggest mosque over the weekend. 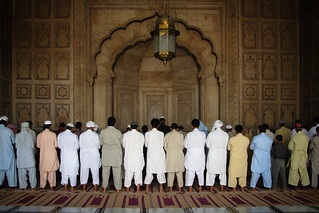 During peak prayer times, such as Eid, up to 100,000 people can pray together at once. In mid-summer, when the temperature soars between 40-50 deg C (100-120 deg F), the paved bricks are too hot to walk on, so visitors cross the courtyard on a narrow path of moistened mats.